Luis Leon Sanchez (Rabobank) took a narrow sprint win at the third stage of the Tour de Romandie, pipping Gianni Meersman (Lotto-Belisol) with Paulo Tiralongo (Astana) in third. Bradley Wiggins finished safely at the front of the bunch but his lead in the overall classification was reduced to just one second after Sanchez, who sat 11 seconds back at the start of the day, picked up ten bonus seconds for the stage win. Three categorised climbs and an uphill finish driven at breakneck speed were enough to rule out the chances of the pure sprinters for today’s stage. Indeed, Mark Cavendish was consigned to domestique duties when the break of the day, which included Irish champion Matt Brammeier (Omega Pharma-QuickStep), had built up a lead of 5 and a half minutes with 50km remaining. It was a rare sight to see the World Champion’s jersey at the front of the pack pulling the Sky team along, with the yellow jersey of Wiggins tucked away out of the wind. When the road turned uphill with 4km to go, the peloton pounced on the remnants of the break and Sky’s Aussie time-trial aces Richie Porte and Michael Rogers looked to have delivered Wiggins to a perfect position leading into the final few hundred metres. Unfortunately, Wednesday’s sprint heroics were beyond Wiggins this time around and the British champion’s tank was empty as Sanchez jumped past. 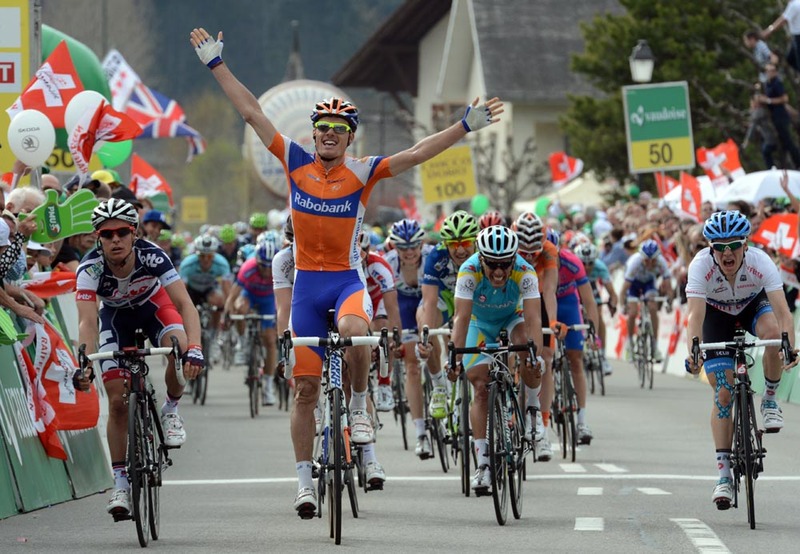 Meersman raised his arms in protest as Sanchez raised his in celebration. The Belgian felt he had been boxed in by the Rabobank rider, but the result stood. With a 10 mile time trial on the final day, Wiggins realistically now only has to worry about one remaining stage, tomorrow’s stage four which includes three first category climbs and a downhill finish into Sion.